Carpet stains can be a pain to get rid of, particularly if you don’t use the correct method to do so and if you don’t do it on time. This is further complicated by the fact that different types of stains need different types of treatment, so you need to be careful lest you end up ruining your carpet. However, this does not mean that you should have to cram how all stains should be treated. There are a few types of stains that are very common in the home, and once you know how to get rid of them then you should be fine. If you are a pet owner, chances are that you have had to deal with carpet stains from the pet once in a while. When left for some time, such stains can start producing an offensive odor, which is why you need to know how to get rid of them. 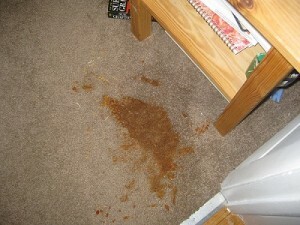 The first step to doing this is cleaning the initial mess, such as stool or vomit. If it’s wet, such as urine, you should blot it out until dry, without any scrubbing. Removing the odor and spot can be done in several ways. These include creating a solution of half a part of white vinegar mixed in half a part of warm water, which is sprayed liberally on the affected area. You should let this soak in for a few minutes, and then blot it out until the area is dry. When almost dry, sprinkle baking soda on the area. Mix liquid detergent and half a cup of hydrogen peroxide (3%) and slowly pour it over the baking soda. Using gloves, rub the mixture into the carpet using a brush. Vacuum the area thoroughly after you’ve left it to dry completely. When left in place, coffee stains can leave a carpet or a rug looking dirty. Irrespective of the color of the carpet, the brownish-yellow tone of a coffee stain is always noticeable. To get rid of it, dry the carpet by blotting immediately after the coffee has been spilt, making sure not to rub the area. Mix vinegar, water and detergent and then spritz it over the stain, rinse the area using a wet rug and then repeat until the stain is clear. You can also try some of the commercial coffee stain removers sold in some stores. Before using them, try them on a small patch of the carpet to make sure that they don’t damage your carpet. These are usually difficult to remove. It is much easier to remove them immediately after the spill occurs. Do this by first dampening a piece of cloth using isopropyl alcohol, and then dabbing the area without rubbing or scrubbing. You may need to do this several times. Once done, rinse the area using water, blot the area and use a wet vacuum to dry the area. Blood is also difficult to remove from a carpet, and you are likely to get better results when you attempt cleaning as soon as the stain occurs. Mix 2 teaspoons of liquid detergent to a full bottle of cold water and then liberally spritz it on the stain. Blot the area using a paper towel to get rid of the stain. Rinse the area with cold water, and repeat the process if it’s necessary. DIY carpet stain removal can help in some instances. In many cases, however, the stains end up being stubborn. Rather than giving up, consult a firm that does professional carpet cleaning in Fayetteville, NC so that they can clean the carpet or rug for you effectively.